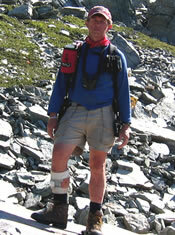 Home » Blog » Passages: Walkin’ Jim Stoltz has left the planet. 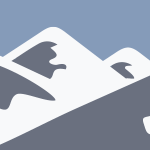 Passages: Walkin’ Jim Stoltz has left the planet. Passages. He made so many. 27,000 miles and still counting, the last time I talked to him at Wild Idaho in Redfish Lake this past May. He came and sang his songs, howled his howls and treated us to his marvelous travelogue show, a uber-wilderness lover among a bunch of wilderness lovers, who among all of us might have hiked as far as he. We have lost a treasure with a gravel voice, a shy smile and an endless insatiable urge to keep walking and working on behalf of wild places. Walkin’ Jim stayed in my back yard a few years ago; deigned sleeping with a roof over his head for his skimpy tent and wandered off the next day, as he had wandered in, following whatever it was that kept him moving. “Whatever,” I suppose, was his absolute, unequivocal, unconditional love for wild places and the creatures that populate them. 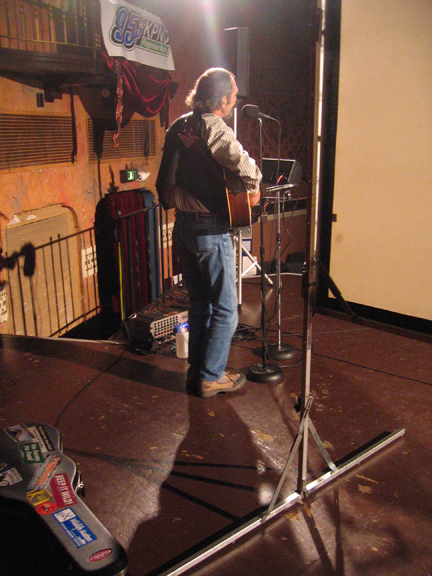 Walkin' Jim Stoltz onstage at the Panida Theater in 2008. Wherever he walked he was touched by what he walked through, and wherever he talked about these experiences, he touched those who listened to his bass treble voice and looked at his incredible pictures. 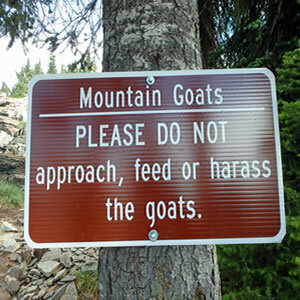 Especially the children. Later, he moved into the classrooms, and the kids were mesmerized by him, a lanky guy who looked as if he had escaped from mountain man times. He told of kayaking with whales and coyote tales of following and being followed by them. He gave endless, patient answers to endlessly enthusiastic questions, and then he drew the kids out, asking for their own wild stories, some of which, I’m sure, may never had been heard before. 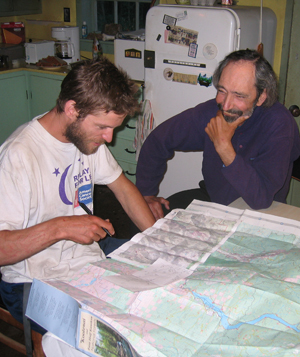 Daniele Puccinelli (L) entertains Walkin' Jim with tales of his hikes through the Scotchman Peaks. He was just recovered from an earlier bout with cancer when he stayed in my back yard. 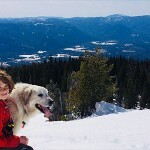 I was amazed at by his skinny toughness, his genuine love for other folks, how much he carried in his heart and how little he seemed to need in his pack. Perhaps his biggest burden was his guitar. The cancer came back and got him, as if it had forgotten, first time around. He didn’t want to go, I don’t think. There are too many other passages he wanted to make. But, we don’t really know what happens after the passage he did take. I would hope he will find even more beautiful and exciting spots to wander through in the Great Beyond Wilderness. Goodby, Mr. Stoltz. Thanks for walkin’ through. There are some people that are just, somehow, BIGGER than the rest of us. Walkin’ Jim was one of them, and I miss him terribly. What a gift he gave us. I remember several years ago at The Panida, hearing Walkin’ Jim sing at a Benefit for Friends of Scotchman Peaks Wilderness. His whole presence was so Heart-Felt and he had us singing along with him as we looked at beautiful wilderness slides! Yes, he will be very much missed by all of us! Bless you on your continuing Journey, Jim!